75 years ago, one of the most decisive battles of World War Two marked the end of the beginning. 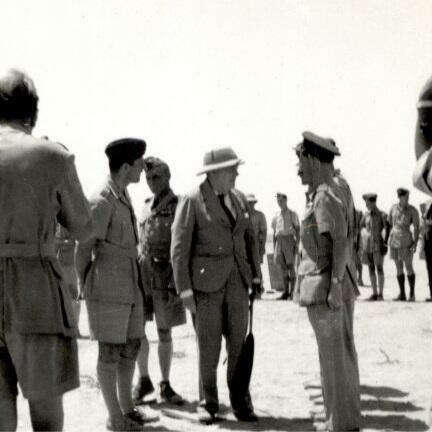 El Alamein was of huge strategic importance to both the Allied and Axis forces in North Africa. Rommel and Montgomery’s forces clashed twice. The second battle would become famous, making a household name of this obscure outpost. The intelligence was a crucial weapon. Rommel’s attack plan was confirmed by intercepts which were deciphered and translated by the top secret Government Code and Cipher School at Bletchley Park, giving the Allies an unseen advantage. In this episode, we bring you a personal perspective on this slice of history, with Bletchley Park’s good friend, the historian Dan Snow. He made an unforgettable trip to the desert with his father, Peter, where they traced the soldiers’ footsteps through the sand for a memorable TV documentary. He looks back on that experience, with Bletchley Park’s Research Historian, Dr David Kenyon.